The DS-IV Print Head from HMI is a dual squeegee head. Using two independent sets of controls to set squeegee pressure and down-stop, the DS head uses a digitally controlled pneumatic system to raise and lower each squeegee as required by the printer setup. The air pressure is regulated to a pre-evaluated set point, but is easily adjusted for changes in process conditions. Pneumatic, programmable pressure control with a computer or touchscreen interface. 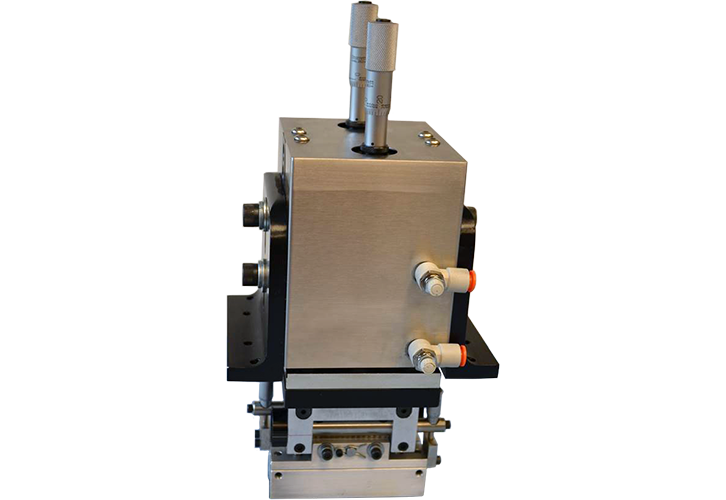 The print head has two squeegee holders, individually adjusted for angle of attack and for parallelism to the substrate surface. Depending on the setup, each squeegee can be set as either a flood squeegee or a print squeegee. In an alternate print or SMT application, both squeegees can be set as print squeegees. Print stroke end points and lift points are set through the printer. The DS-IV Print Head is a rugged and reliable dual squeegee head. The addition of digitally controlled pneumatic regulators ensures dependable print results throughout the process run. For assembly methods that require a cost-effective, digitally-assisted dual squeegee head, the DS IV Print Head is the obvious choice.